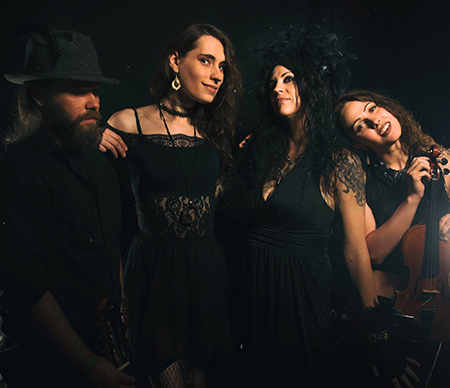 The Murder is ruffling feathers around the world with their unique fusion of goth, cabaret, classical music and gypsy storytelling, at once theatrical and deeply personal. Violinist Haleigh Black, vocalist Jane Grace, and guitarist Jimmy Branham support pianist and composer Jane Crow as they soar into the emotional highs of true love and happiness, only to swoop down again into the depths of despair. Fans have lauded the group for their delightfully expressive and powerful presence. A truly original act!